Manchester City hope Frank Lampard will be able to face Sunderland on New Year's Day despite his loan deal from New York City having come to an end. The 36-year-old midfielder joined City in August but his loan spell ends at midnight on 31 December. An option to sign him again would not be permitted until the Premier League transfer window opens on 3 January. 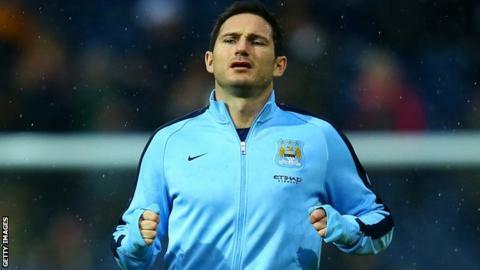 Manuel Pellegrini has named Lampard in his squad and said: "Today we finish December. I hope we will have news." Lampard, who began his career at West Ham, spent 13 years at Chelsea before he was released in June. He signed for newly-formed New York, the MLS franchise owned by City, in July on a two-year deal has scored six goals in 17 appearances for Pellegrini's team.